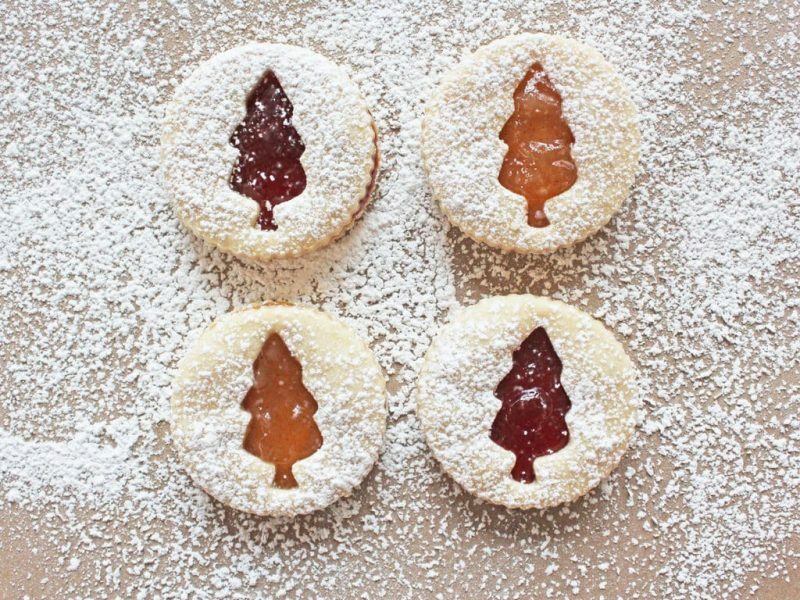 It wouldn’t be Christmas without Jam Sandwich Cookies—they are a staple on the cookie platter. 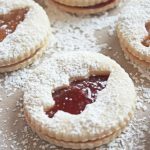 Strawberry jam sandwiched between two buttery cookies are simply delectable this time of year. The cookies are your standard butter cookies that can be used in half a dozen different ways that I’m currently experimenting with (cherry bar cookies with hazelnuts anyone?) But for these sandwiches, all you have to do is use cookie cutters and bake at 375. 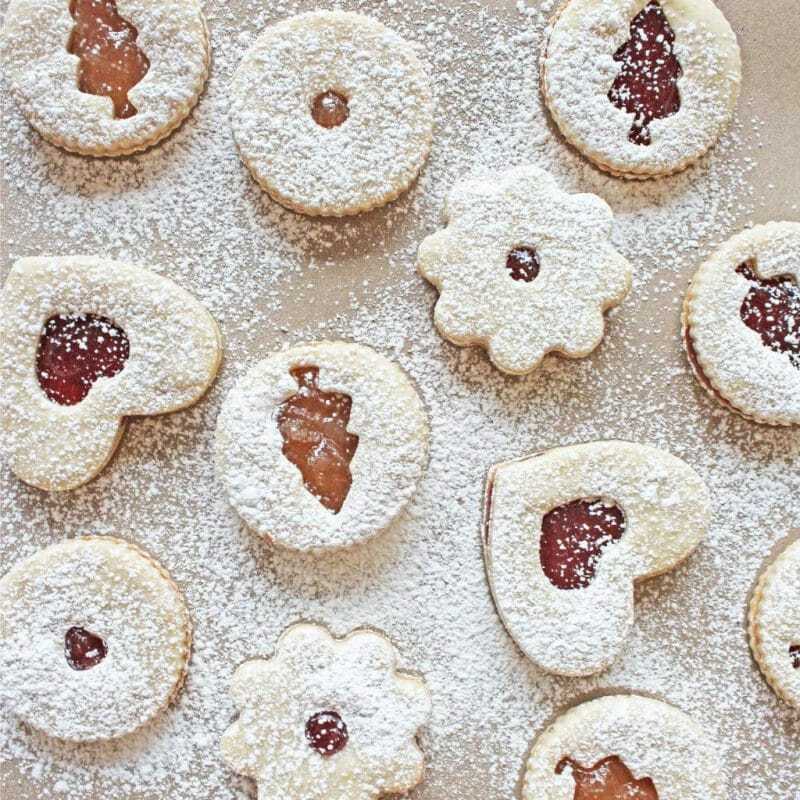 The fun part is using mini cookie cutters to make shapes in the center of the cookies for the jam to peek through. I used a mini Christmas tree and heart for a few. If you don’t have a cookie cutter small enough, use a frosting tip or straw to make a hole in the center. Another word of advice: don’t make holes in the center of all the cookies. I nearly did before I realized if I sandwiched two cookies with holes together the jam would fall right out! Blonde moment. So cut holes in the center of half the cookies and keep the other half of the cookies whole. Use a cookie with a hole and a cookie without a hole for each side of the sandwich and you’re good to go! In the bowl of an electric mixer, mix the flour, sugar and salt until combined, about 5 seconds. With the mixer on low, add the butter one piece at a time; continue to mix until the mixture looks crumbly and slightly wet, about 1 to 2 minutes longer. Add the vanilla and cream cheese and mix on low until the dough just begins to form large clumps, about 30 seconds. Preheat the oven to 375° F. Roll out one of the dough disks to an even 1/8-inch thickness. Cut into desired shapes cutting a hole in the center of half the cookies. Place cookies on a parchment lined baking sheet about 1 1/2-inches apart. Repeat with second dough disk. Bake until the edges of the cookies are light golden brown, about 10 minutes, rotating the baking sheet halfway through baking time. Cool cookies on wire rack. 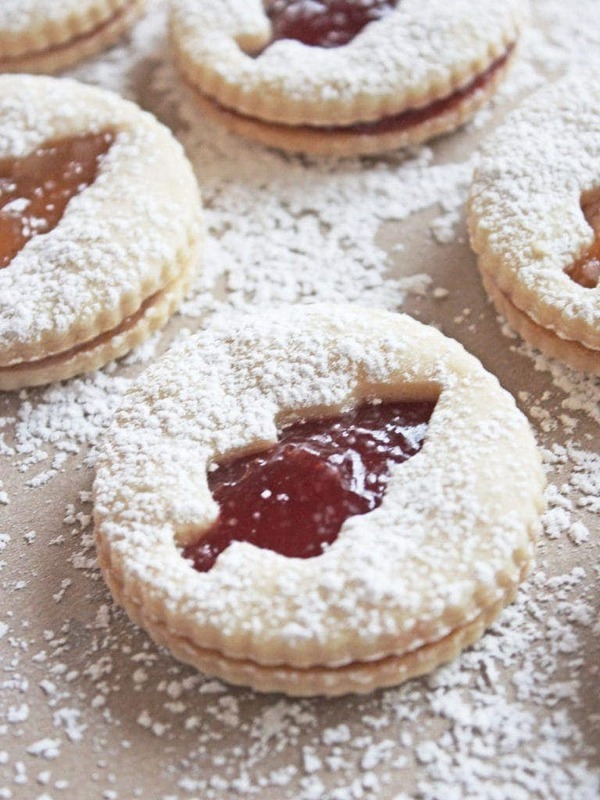 To prepare cookies, spread the jam on the bottoms of half of the cookies, spreading it lightly at the edges. Top with the remaining cookies, bottoms down. 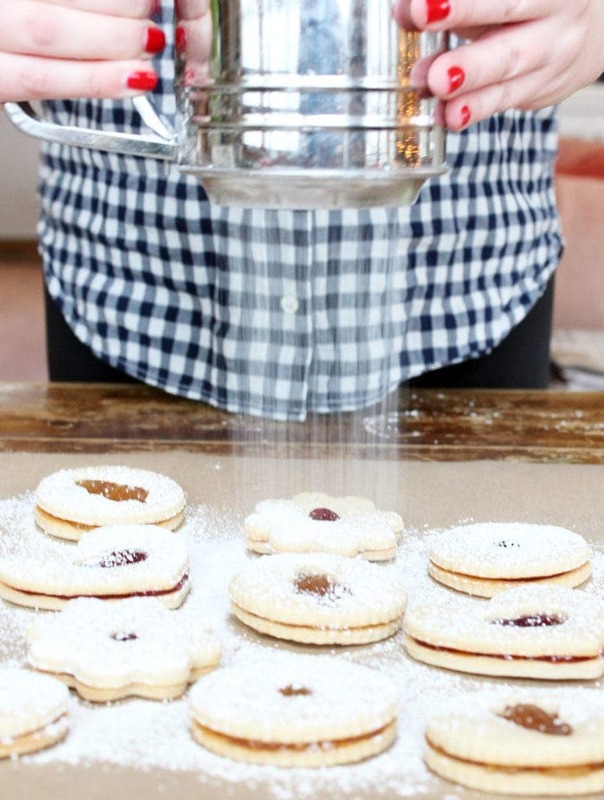 Dust the tops with confectioners’ sugar. Store in an airtight container in the refrigerator for up to 1 week. Would you freeze the discs before or after baking? Thanks! Hi Teresa – Freezing the discs refers to step 2 where the dough is separated into two round discs and chilled. You can alternatively freeze the dough and defrost it in the refrigerator befor rolling out and cutting with cookie cutters. Thank you ! Have a happy holiday!